You can buy THE SUB® in THE SUB section of our website. 1.14 THE SUB® makes a noise while cooling the TORP® – is this a problem? 1.16 My SUB keeps pumping/making noise, but no beer is coming out. It can be that the TORP was not inserted correctly and has not correctly activated the pressurizing mechanism. Please remove the TORP and try inserting it again. Our Craft TORPS are a few millimetres smaller than our regular TORPS, which is why we include a plastic clip with them. Please make sure that you have placed the clip on the TORP – simply insert the tube into your TORP, then slide the clip over the top of the neck of the TORP. This will help the TORP fully activate the pressurizing mechanism. You can also remove this clip once you have finished the TORP and re-use it on your next TORP if needed. 1.19 My SUB® did not come with the tube to connect my beer. 1.20 Is there a loyalty program for THE SUB®? 1.21 What is the difference between THE SUB® and THE SUB® Compact? The differences in terms of function between our SUB® models are displayed below. All models are made to function with all of our TORPS®. The aesthetic differences are that THE SUB® Compact is slightly smaller in size and is loaded from the top, THE SUB® is loaded from the front. In addition, the light on THE SUB® Compact is not an on/off switch as it is on THE SUB® - it is turned off by unplugging the device. Once in THE SUB®, cooling down a TORP® takes 10 to 16 hours (depending on starting temperature of the TORP®). When your beer is chilled to the right temperature, then the light on the front of THE SUB® will turn green. To speed up the process, ensure your TORP® is fully chilled before inserting it into the SUB®. Set your fridge at the lowest temperature and store the TORP® on the lowest shelf (this is the coldest area) for 6 to 10 hours, or until the cold indicator on the TORP® turns dark blue. Yes, our Craft TORPS® are unpasteurized, which also means these TORPS® have a shorter shelf life than our regular selection. 3.6 What is the clip on my Craft TORP for? The use-by date is printed on the side of the keg, towards the bottom, or underneath. If the date is not on the keg, contact our Customer Care team and be sure to keep the defective keg for further investigation. 5.1 What is the best way to care for my beer glasses? 6.1 What is the BeerTender system? The BeerTender system consists of a machine and 5L kegs of beer. These kegs are equipped with an integrated CO2 cartridge and are disposable when they are empty. Simple to use, the BeerTender machine keeps the kegs in optimal conditions at an ideal temperature of 4 °C, to serve draught beer at home just like a real bartender. 6.2 Is the machine compatible with other types of drinks? 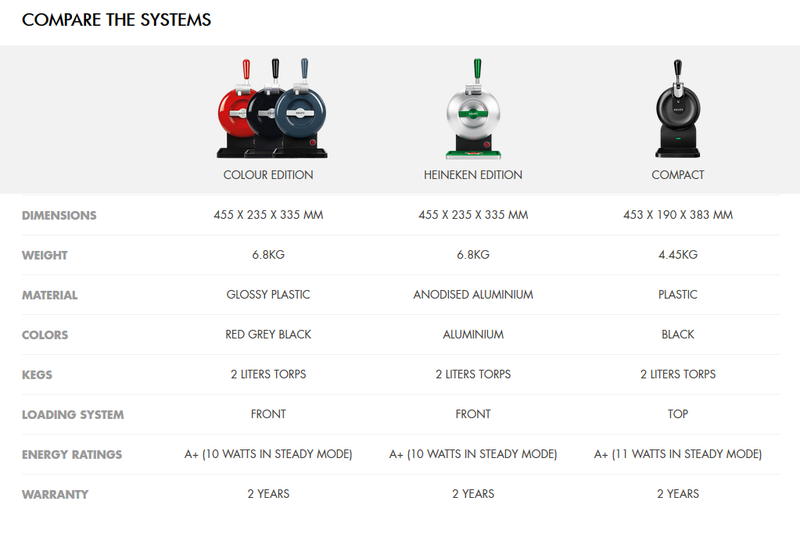 The machine is only compatible with 5L kegs from the Heineken Group, for example: Affligem kegs, Pelforth kegs, Desperados kegs etc. 6.3 What are the BeerTender tubes? Your beer pump works with BeerTender tubes that connect the kegs to the machine. In order to preserve the quality of the beer and to avoid having too much foam, we recommend using a different tube with each new keg. Beware, the BeerTender tubes and the TORPS tubes for THE SUB are not the same, as each beer pump works with its own service tube models. The TORP tubes for THE SUB are integrated into the TORP's lid. 6.4 What are the electrical characteristics for the machine’s power supply? Should it be connected to an earthed socket? The BeerTender only operates with an electric socket of 220-240 V. This information appears on the back of the product and the length of the power cord is 1.4 m (an extension cord should be used if it is too short). There is no water circuit or external gas cartridge. It is not necessary to connect the machine to an earthed socket. 6.5 What is the energy consumption of the BeerTender? The power consumption is estimated at 65W, i.e. the equivalent of a light bulb. However, consumption varies according to the environment. For example, the higher the outdoor temperature, the higher the energy consumption is. 6.6 Can the machine be used outdoors, in a boat or a caravan? Yes, if a 220-240 V socket is available and the temperature is between 12 and 30°C. 6.7 Should I leave the BeerTender on all the time? Yes. As soon as you turn off the machine, the beer is no longer chilled and becomes unfit for consumption. 6.8 How do you know that the machine is on? When the red light on the top of the machine is on. 6.9 No lights are on or the light is orange. What should be done? If no lights are on, press the On/Off button. If you do not get any results from this, unplug and then plug the machine in again. If nothing still happens, call Customer service. When the light is orange, this means that the machine is running and that the keg is cooling down. 6.10 By removing the empty keg, beer flows into the refrigerating chamber and/or into the tap cover. Be sure to clean and dry the refrigerating chamber and/or the tap cover. You can then use the machine. 6.11 The keg is leaking and beer flows directly into the refrigerating chamber. "Take the keg out of the refrigerating chamber and check that the connection of the BeerTender tube to the top of the keg is correct (connection button pressed all the way down). If it is not properly connected, firmly press the BeerTender tube connection button until it cannot go down any further. If it is properly connected, contact Customer Service." Each tube is designed for single use; check that you have used a new tube for your new keg. If the leak continues, check that the connection of the BeerTender tube to the top of the keg is correct (connection button pressed all the way down). In the event of improper connection, firmly press the BeerTender tube connection button until it cannot go down any further. If the problem persists, contact Customer Service. 6.13 Are there instructions for the machine? Yes, simplified instructions are available inside the machine’s lid for permanent availability. If you have lost them or if they were not supplied with the machine, contact Consumer Service. Moreover, if the sticker supplied with the instructions does not stick, make sure to clean the lid of your BeerTender and to degrease it. 6.14 Beer begins to flow as soon as I install the BeerTender tube. Check that the tap handle is up. Check that you have used a new BeerTender tube with the keg. Check that the connection of the BeerTender tube to the top of the keg is correct (connection button pressed all the way down). If this is not the case, firmly press the BeerTender tube connection button until it cannot go down any further If the problem persists, please contact Customer Service. 6.15 I have no more BeerTender tubes, where can I find them? If you have exhausted the stock of tubes supplied with your machine, you can order them from the website. With each new keg used with the BeerTender, you will need a new BeerTender tube: always remember to have a small stock of tubes in advance so you can continue to use your machine between the time you order your BeerTender tubes and the moment you receive them. 6.16 How can I clean the BeerTender? Unplug the machine before cleaning. Wipe it (inside and out) with a damp cloth (or sponge) soaked in a mild detergent. Clean the drip tray after each use with warm, soapy water. Do not immerse the machine in water. The use of detergent products may damage it (vinegar, solvent, petrol) and therefore, should not be used. 6.17 What is a normal noise for the BeerTender? For a BeerTender machine, the fan makes a very slight noise when cooling the keg. When the air compressor rebalances the pressure of the keg, the machine will vibrate slightly for a few seconds. 7.1 What are the advantages of an account? 7.2 How can I create an account? 7.3 Do I have to create an account to place an order? 7.4 How can I update my personal information? 7.5 I can't sign in to my account. How can I reset my password? 7.6 I lost my account login information (username & password). 7.7 How can I remove myself from your email list? 8.1 What payment options do I have? 8.2 Is there a minimum order value? 8.3 Can I save my payment details for next time? 8.4 Where are my payment details stored? 8.5 Can you guarantee that my payments will be secure? 8.6 When trying to place an order, I receive a notification that payment is not possible. 8.7 Who can I contact if the price on my invoice and the price of my order do not match? 8.8 I have a voucher, but it is not working. 8.9 Where can I find my invoice? 9.1 What delivery options are available? Standard delivery through SEUR is within 1-2 working days. 9.2 How much does delivery cost? 9.3 How can I track my order? We will keep you informed by email. Please use the Track & Trace code in your shipping confirmation email to track your order. 9.4 Who should I contact if there's an issue with my delivery? 9.5 I only received part of my order; what should I do? The shipment confirmation email currently only shows one tracking number. Due to system limitations we are not able to show all tracking links. Depending on the volume, your order can be shipped in multiple parcels. Aside from a note in the shipment confirmation this is currently not visible. We are aware that this is inconvenient and are working on a solution. 9.6 Can I have my order delivered to an address that is different than my billing address? Yes - you can have your order delivered wherever you like within Spain. You can save multiple addresses in your profile for easy access in future. 9.7 Can I have deliveries shipped internationally? 9.8 Can I cancel my order? 9.9 Can I make changes to my order? 9.10 How can I return the products? 9.11 When I accept my delivery, do I need to prove that I am at least 18 years old? 9.12 My order is a gift. Is the packaging discreet? 10.1 I would like to claim my warranty. Krups® grants a two year warranty on THE SUB®, starting from delivery date. Claim of warranty may lead to repair or replacement. You may return your unused SUB® within 30 days for a full refund (see article 9.10). In case your SUB® needs to be repaired, we will provide you with a return label or you can send it to a GroupeSEB repair center nearby. Repairs on average take between 14 to 21 business days starting from the day we receive your device at our repair center. More information about the warranty can be found in our Terms & Conditions. The Krups® International Limited Guarantee can be found here. 10.2 What is your warranty policy? You can find information on our product warranty under section 2.11 of the Terms & Conditions . Krups® International Limited Guarantee can be found here. 11.1 How can I contact the Customer Care team? In case of questions or comments please contact our Customer Care team. We are available Monday - Friday from 10am - 5pm. We are closed on national holidays. 11.2 I have a complaint, who can I contact?